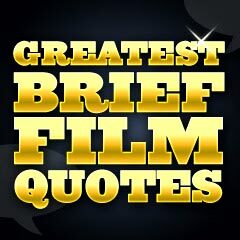 Greatest Brief Film Quotes: Here's a great collection of brief, concise, succinct, and short retorts, remarks, insults, one-liners and basic quotes (usually four to five words maximum), some from the greatest films of all time. All are memorable, quick to read, and easily quotable. Many of them are available to listen to here: Greatest Film Quotes by Decade.